I hope this title didn't mislead anyone into thinking I forget to mention some crazy ultramarathon and I was actually, you know...running all day. Ha! Far from it. In actuality though, I spent pretty much my entire day so far thinking about it, reading about it, watching it on TV and then a little actual running in there for good measure. If you live under a rock, or have better things to do with your Saturdays, today was the US Olympic Marathon Trials in Houston, Texas - for both men and women. I know international races often have more prestige and have a wider range of competitors, but I really enjoyed this because I honestly felt like I would have been happy no matter who won. 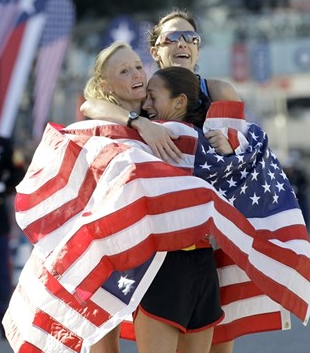 So it was (in order) Shalane Flanagan, Desiree Davila and Kara Goucher who rounded out the top 3 for women, and who will be representing the US in the Olympics come summer. For the men, top 3 were Meb, Ryan Hall and Abdi. As we speak, I am wearing underwear, a running jacket, knee high socks and a cowboy hat. Those gals have inspired me to be more adventurous with my fashion today - just need to get my hands on a giant flag to wear as a cape. There was no live video coverage of the event, so I followed along with the Runner's World updates online for a little over two and a half hours - AKA exactly the time I planned to do a long run. Whoops. All of a sudden it was 11:15 and time to run. Hopped on the treadmill (still no uphills/downhills on the schedule for me) and ran a half marathon. Please ignore the fact that it took me longer to run a half marathon on the treadmill than it did for the guys today to run an entire marathon. Details. That's 13.1 in 2 hours, 10 minutes and 15 seconds. I really was not feeling this run today, but I think the whole Olympic trials pushed me to finish. So what's a gal to do after a morning of reading running updates and then running? Take an ice bath, scarf some food and watch the two hour recap of the race all over again, duh! I truly believe that if I mention one more thing about this marathon today my husband will just walk out. Poor guy needs to detox from girly running nonsense. I promised him a trip to see a movie called "Bad Guys, Guns, Action and Explosions" or something like that tomorrow. They're all the same to me. 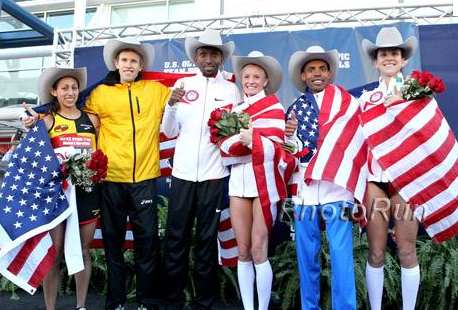 Did you follow the US Olympics Marathon Trials today? Video or live updates? Please don't judge that I did both. I only felt a little ridiculous watching a race where I already knew the exact outcome. Any great runs today inspired by the race? Do races make you want to run more? Races always make me want to run right afterwards. Whenever hubby watches me race, he is usually excited to run for a while afterwards. The excitement of the finish line is so thrilling and inspirational! I didn't watch, but I did check who won when I knew it was over! Random question- did you run 13.1 today as part of the NWM/Nike+ virtual half marathon thing? No - I didn't know about it actually! Was supposed to just be 13 miles but I had to add the .1 in to make it complete! Nice job on the treadmill half! Oh gosh, I disconnected from FB, twitter everything so I wouldn't know who won. Then I watched the recap show. I'm super inspired to run. :) I think I'm more excited to run my marathon in 2 weeks too! ANd yes, go watch some "Guns, explosions, car chase, bing bang boom" movie with the hub! "Please ignore the fact that it took me longer to run a half marathon on the treadmill than it did for the guys today to run an entire marathon. Details." I made a similar comment after watching the trials on NBC! So impressed that you ran 13.1 on a TM. Don't think I could do that. Kudos. Wow, I can't believe you ran a half marathon on a treadmill. I would die, great job! I had an all day running day today too (with some swimming thrown in there). My husband and I had a snowy 5K race and then we watched the trials on DVR later in the day! You're speedy when inspired aren't ya? Great run!!!! I actually, sigh, didn't see or follow any of the marathon trials (I've shamed the running community). WOW though I have amazing news to add to the results you've posted . . . in 2 weeks Shalane is speaking at our Running Club's annual banquet and I'm going to be in the audience. She's having a "girl chat" (I've been told it's going to be more Oprah less ESPN) for an hour before the banquet begins and then she'll be the keynote speaker after dinner. Cool beans (yeah, I know that expression is SO 80's). I think that is DEFINITELY "cool beans"! How exciting. I've yet to meet an elite runner but I bet it would be a great experience. I just finished watching the trails - I dvr'd them because I had an appointment right in the middle of the scheduled play time. I was very happy that Shalene made it! She is such a great runner. I'm waitin for my little one to go to bed to watch the dvr'ed coverage (so I've skipped every update or parts of posts that say who qualified) I can hardly wait to watch the recap!! Great run today! 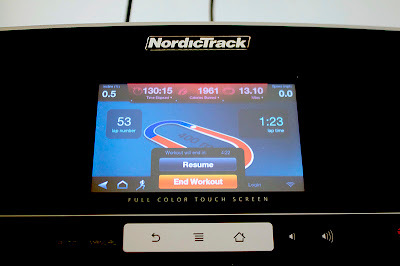 I've never done more than a 10k on the treadmill, it's too boring to go longer! i slept in and watched it on TV...i may have teared up a couple of times because of excitement. so no, i will not judge you if you dont judge my tears. Way to go on running a half! And congrats even more for getting it done on the mill :) I didn't get to watch it or follow it and was so bummed!!!! This is my first time online all day! I followed along in the morning via Tweets and then watched the coverage later this afternoon. My poor hubby too - he heard more than he cares to today about marathons! I'm so excited to do my long run tomorrow! You'll have to do it next weekend now! Cried my way through the men's and women's finishes. Those 4th place finishers! Talk about ripping your heart out!!!! I almost couldn't take it. It was amazing to see how strong they all looked- like running a marathon was no big deal. So inspiring. Ritz crying after getting fourth made me cry too. He pushed so hard and JUST missed making the team! Heartbreaking. since we live near Houston, and had the expo yesterday, we were able to witness the race, in person. It was amazing. Something I'll never forget. We were up close and personal to some of THE most amazing athletes in the U.S! very cool. I was able to snap a few of the women, as they posed for those pictures. As I watched, I actually cried. It was THAT amazing. Hard to describe, but it was definite motivation for anyone! I bet that was such an amazing experience! I can't think of ANY better motivation. I ran yesterday morning on the treadmill as it was below 10 degrees here. I loved watching the trials, I DVRed them as we were not going to be home in time to watch live. So bummed I missed watching it! I didn't even DVR it because I thought I was going to be home in time. Great job on getting in a good long run! I only got to watch about the first 45 min of the coverage, although I already knew won. I wish I had DVR'd it to see them crossing the finish line though. The results are exactly as I'd hoped for with one exception: I was really hoping for a Meb/Ryan/Dathan men's trio. Ok, don't tell anyone...but I had it on in my patient's room at work and watched it all day while I was in there! He actually enjoyed it and we chatted about it a little. I can't believe you can run a half marathon on a treadmill!! My limit would have to be about 45 minutes max. Do you listen to music or watch tv? Loved the trials although only able to 'watch' on live updates. Love all the runners and excited to see the leadup to the games. I definitely need music on the treadmill! A TV is best but I don't have one set up there yet! Good for you for doing a half on your own on the treadmill!! That takes some guts! Finishing my first half last weekend definitely inspires me to run more. But I still have no desire to try a full...haha. the trials were so freaking awesome!!! so inspiring! and YESSSS for your run!!!! so happy you got in a good LR friend! hope you are doing well! I followed the online coverage and then watched it later. At some point I think I ran, but I can't really remember. It's been a long day. Despite my lack of inspiration I PR'd today! I watched the trials for a little while on tv, but didn't really pay attention. I find it difficult to watch any kind of sporting events unless I'm actually there. Usually, I find it kind of boring. Unless it's gymnastics. I watched a little on TV, but I already knew the outcome, so I couldn't really get into it. This title reminds me of a time I DID have an entire day of running, from 6 am to 8:30 pm. I was there in Houston and I watched it happen! It was incredible! And the knee socks/cowboy hat photo cracks me up! Holy epicness! That race was incredible! Great job on your run! I didn't see the race and now I'm sad I missed it.